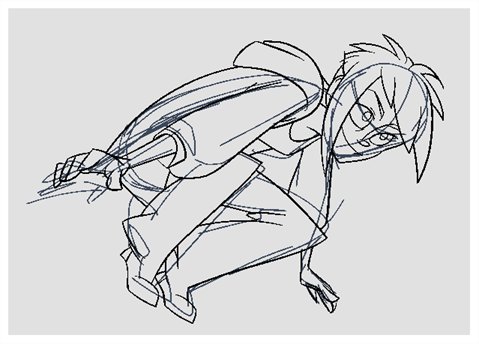 Once your rough animation is correct, you can start adding extra details, such as arms, clothes or hair. You can add the extra details on the same layer with the same colour or you can also create a new colour so that you can always see your original sketch. If your primary and secondary animation were done as a rough drawing, it is now time to put your drawing on model, also known as tie down. This means that you have to review your animation and ensure that every single detail is on model and there is no volume distortion. 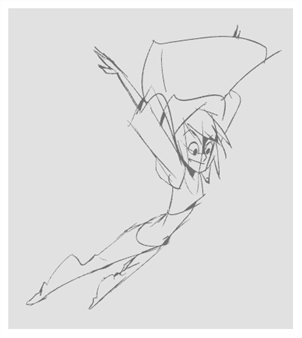 You can do this directly on the original sketch layer or on a new layer. If you want to keep your rough animation as it is to avoid any mistakes, you can add an extra drawing element and use the Light Table feature to draw over the first drawing element. This technique can also be used if you want to reuse your rough animation for other characters. For example, if you have a rough walk-cycle, you can reuse it for another character and add its personal features in a new layer. This way, you only need to animate the secondary animation instead of the whole body again. 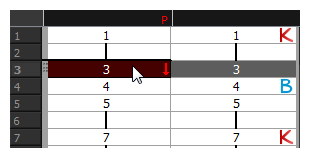 In the Xsheet or Timeline view, select the cell in which you want to add new details. In the Colour view, create a new colour (give it the same name and add the prefix _2 or _sec, for example) or select the same rough colour as before. In the Drawing Tools toolbar, select your drawing tool. In the Camera or Drawing view, draw the secondary animation. 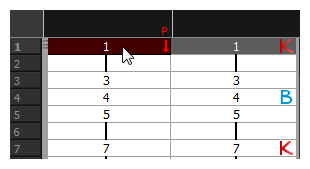 In the Xsheet or Timeline view, select the next cell in which you want to draw. Press F and G to navigate between your drawings. Select View > Onion Skin > Show Onion Skin. In the Timeline view menu, select Onion Skin > Show Onion Skin. You can also use the Playback toolbar to play the animation in real time. 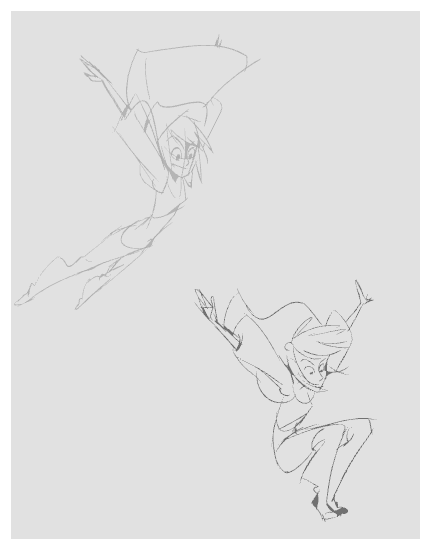 Add a new drawing layer and name it secondary_animation. In the Timeline or Xsheet view, select the rough layer's timing. Copy the timing and in the top menu, select Edit > Paste Special or Ctrl + B (Windows/Linux) or ⌘ + B (macOS). Choose Never create drawing files from the options to paste the timing but not the drawing files. If you are working in the Drawing view, in the Drawing View toolbar, enable the Light Table. In the Xsheet or Timeline view, select the cell where you want to add the new details. In the Tools toolbar, select your drawing tool. 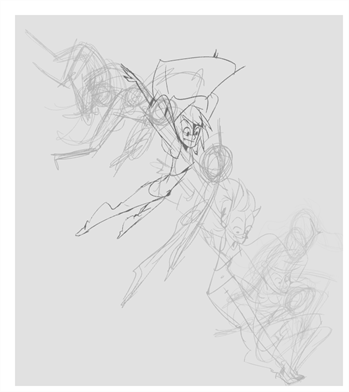 In the Drawing or Camera view, draw the secondary animation on top of your rough drawing. ‣ In the Xsheet View, select the next cell in which you want to draw. ‣ In the Camera, Drawing or Xsheet view, press F and G to navigate between your drawings. In the top, Drawing View or Camera View menu, select View > Onion Skin > Show Onion Skin. 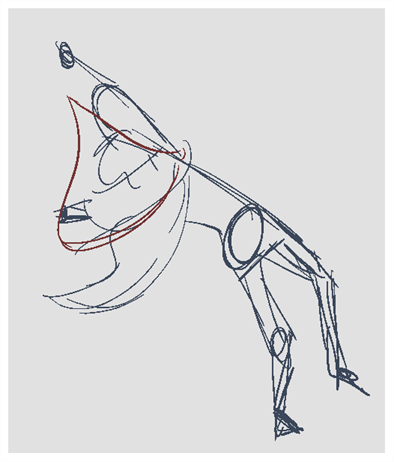 In the Camera or Drawing view, draw the next secondary animation.